Traditional real estate marketing was disrupted by online classifieds years ago, with a huge shift from Print Media to Online. However, these companies nowadays struggle to satisfy a growing segment of on-the-move, internet-everything tenants: Millennials & Gen Z. As global mobility increases and consumers expect more and more pay-as-you-go services, a new wave of rental tech companies, which can be referred as “Online Rental Marketplaces” are emerging to provide the efficiency and full online experience that Gen Y and Z users prefer. These websites verify the properties, by sending their employees to listed apartments/houses, checking all the amenities in person. Therefore Tenant doesn’t need to arrange a viewing in person. On top of this service, usually Online Rental Marketplaces manage the deposit transfers, which boosts the trust factor. Tenants pay the deposit online to marketplace and later moves into the apartment he/she booked online. Rent deposit payment is transferred to the Landlord only after Tenant moves in and confirms that the verified apartment is exactly as it was shown on the pictures & videos on web, including all amenities listed in working conditions. On the other hand, value proposition for Landlords include not only online tenant referencing & getting rid of planning viewings but also being able to rent their listings a few months upfront, which increases the utility of the units.In some cases, some online rentals companies also act as a Property Management Company, being responsible for management and maintenance of the apartment, giving guaranteed income for landlords. As Nestpick, we are growing to be the first touchpoint for the new age tenants when they are searching for mid to long-term rentals, aggregating listings from 80+ rental websites all over the world, from classifieds to direct booking platforms, by listing their furnished apartments, rooms for rent, co-living spaces and student residences. This helped us reach a solid understanding of the new players & their business models in residential real estate rentals market. Real estate classifieds like Trulia or Zillow in the US; Immobilienscout24, Rightmove, Zoopla or SeLoger in Europe successfully brought the housing search online in the late 90’s. More recent websites like Apartmentlist, Apartments.com, Rent.com or Zumper identified the need to focus on the rental vertical. As the sharing economy found its culmination, peer-to-peer rental websites like Easyroommate.com, Sublet.com, Spareroom.co.uk or Wg-Gesucht came to prominence. Their marketplaces match private accommodation letters with potential tenants and allow them to interact directly through their platform. Although all these web companies strongly improved the rental experience, a key step of the process was still happening offline: the transaction. For tenants, visits and paying the rent; for landlords, lease agreements and managing vacancies. This is precisely the problem that startups like Spotahome, Uniplaces, Homelike or Housing Anywhere have more recently decided to tackle. With thousands of vetted properties that users can rent without viewing, people can rent their new home just like they book hotel rooms (Please note that ~15 years ago you could not book a hotel room online either), and by offering rental management softwares to the landlords, these companies have managed to minimise the friction that existed in the rental process. 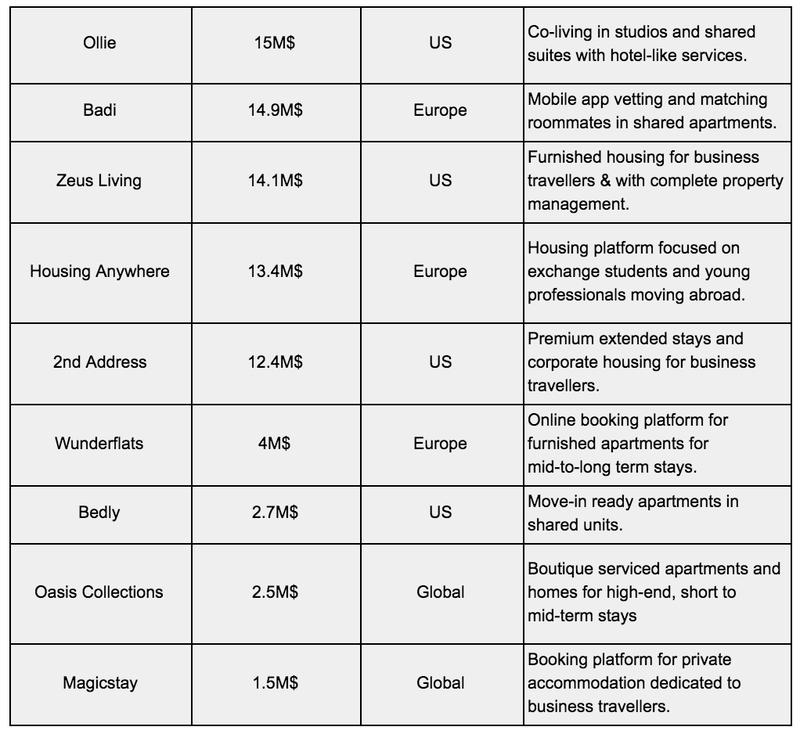 As a response to the current new trends of living and increasing mobility, some startups have further specialised in verticals like student housing (Student.com), some in shared housing (Roomi, Badi), corporate housing (TheBlueGround, 2ndAddress, Zeus Living) or some came up with their co-living projects (Common, Starcity, The Collective). In May’18, Techcrunch already identified the trend and increase in funding in shared housing startups in the US. We found it useful to deepen this analysis, and came to understand two things: First, this growth is a global phenomenon. Second, the shared housing trend is a consequence of a more profound change in the way people apprehend housing. This change englobes students, young professionals, corporate travellers, digital nomads and pretty much everyone who is moving from one urban hub to another, anywhere in the world. With Nestpick, we try to understand the needs of the above mentioned audience and reach them all around the world. We showcase these growing companies housing offers to them. 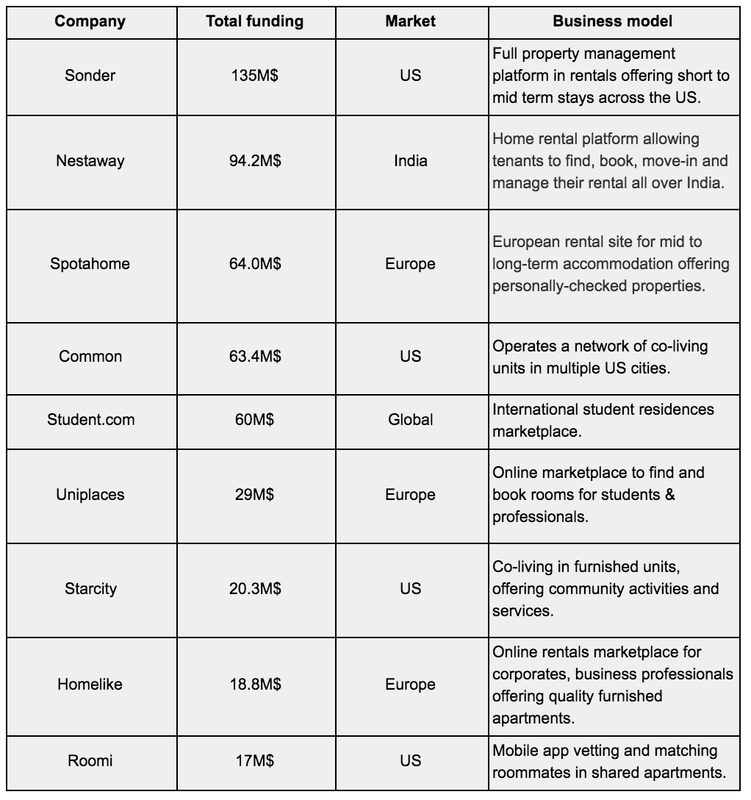 To give you a better understanding, we listed* a bunch of these emerging new residential rentals tech companies, which has recently raised funding. Table 1: A selection of online rental companies with >15M $ in VC funding according to Crunchbase. Table 2: A selection of Online Rental Companies with <15M $ in VC funding according to Crunchbase. We know from the tweet of Airbnb founder Bryan Chesky that 20% of the company’s “business” was, already in 2015, coming from 1-month and above stays. Although Airbnb’s core focus is still on holiday rentals and short term stays, a wave of new regulations on short-term rentals is hitting some of the biggest cities in the world: San Francisco, Paris, Berlin, Barcelona, etc. This might eventually lead the giant to have more focus on 1+ month stays, and threaten companies that are less established or have less resources. If and whenever this happens, the existing and upcoming players will still have a big window of opportunity. The market is big and growing rapidly all around the world. So far, millions of users have been on Nestpick and searched for their new home from the majority of the companies listed above. By bringing the market together globally, our goal is to be the first touchpoint for new generation tenants, allowing them to rent online anywhere in the world, offering them full spectrum of new housing options. Nestpick is currently available in 150 cities all over the world and serves in 7 languages. We also help landlords and property managers from anywhere in the world to find, among our partners, the right website to publish their apartment and manage it on a dedicated platform. By doing so, the properties are also automatically displayed on Nestpick. Whether you are a rentals startup, property manager or private landlord, please feel free to contact us and we will see how we can build a mutual benefit partnership. *This is a non-exhaustive selection of tech startups offering online rental services, mainly based on the amount of funding received visible on Crunchbase. Many more players can be named: Bedly, Student Inn, Kangaroom, Flatio, Gromia, Medici Living, Forenom, Rent in Singapore, Beroomers, Roomster, Paristay, Study Abroad Apartments, Coming-Home, Tempoflat, RentMyStay, Rexidence, Blueground, Wg-suche, Rooming, Chez Nestor, Pepe Housing, 4stay, Unite Student, Roomlala, Projects xyz, Findroommate, Erasmusu, Paris Attitude, Studapart, Swiftflats, Location Étudiant, Ideal flatmate, RentSFnow, Cityrooms, Smartments, CorporateStays.com, Housestay, Roomeasy, Spareroom, Oakwood, Bridgestreet, UrbanDoor and others. P.S. : This is my first ever blog post and any feedback is more than appreciated. Please reach me via Linkedin in case you want to talk about the article, about the market or about Nestpick. We can improve the list of funded startups with your inputs. Co-founder and CEO at Nestpick. Previously, cofounder and Managing Director Clickbus Turkey.